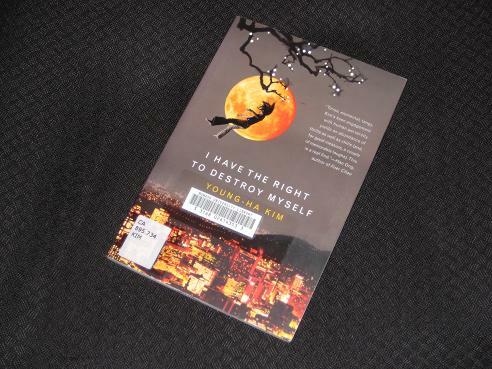 I Have the Right to Destroy Myself is a novella set in mid-90s Seoul, a story in which a shadowy narrator talks about a group of young people going about their lives in the Korean capital. A man with a calm demeanour, he first talks us through his daily routine, frequently alluding to his ‘work’, before introducing the reader to one of his ‘clients’, a young woman known mainly by her nickname ‘Judith’. As Judith bounces between two brothers, C and K, the writer portrays a woman who seems able to cope with anything life can throw at her, provided she has enough Chupa-Chups to hand. However, appearances can be deceiving. Judith’s life is far from happy, and her reason for meeting the narrator is to cure her problems – once and for all. After the relative disappointments of Your Republic is Calling You and Black Flower, I Have the Right to Destroy Myself comes as a relief, a story I enjoyed from the very start. A dark, brooding piece full of end-of-millenium angst, it has much common with works by writers like Park Min-gyu and Bae Suah, and it works much better than Kim’s longer, genre books. This appears to have transferred across to the translator’s work too – the writing here feels far clearer and more focused, the sparse style fitting the mood of the book. In a city full of people tired of life, the narrator of the story has taken it upon himself to offer them a way out. He seeks out those who might need his help and counsels them through the path they are to follow, easing their way out of a tiring, depressing world. The younger brother, K, is very different. He’s the driver of one of Seoul’s notorious ‘bullet taxis’, a man longing for speed but destined never to reach the velocity he desires. K is unable to understand his brother, or the relationship he has with Judith, but he’s just as frustrated by his own limitations. In their own ways, the brothers are just as unhappy as the women they encounter. There’s a distinct cinematic feel to the book, with C’s project merely one manifestation of the visual environment. Kim paints striking images of C and Judith stranded in the snow, K blistering down the highway at 180 km/h in the dark, and Mimi feverishly swinging her paint-splattered hair across a white canvas. This visual sensation is enhanced by the narrator’s frequent allusions to art. The three images he describes (Klimt’s Judith and Holofernes, Delacroix’s The Death of Sardanapalus and David’s The Death of Marat) are all evocative and highly relevant to the story. Can the case be made that the woman from Hong Kong and Mimi are the same woman? They both came into contact with the narrator, and notice: Mimi says to C – A guy once came up to me and asked me if I liked Klimt. That is the same question that the narrator posed to the woman from Hong Kong. There is no need to re-read on my account, I was just wondering because you mentioned three women in the story, and I thought it was made a bit clear that probably two of them were the same woman. Maybe it was my interpretation or I got something wrong, but the author did make a wonderful job making all the character identities intriguing and ambiguous. Thanks a lot for reviewing this book!